French riot police have deployed tear gas on protesters who gathered at the Place de la Bastille in central Paris after preliminary results of the first round of the presidential election were announced. 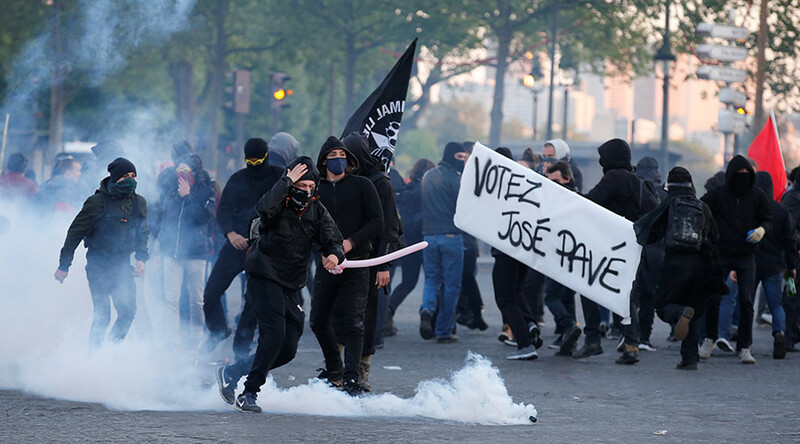 Protests in Paris in the aftermath of the vote have turned violent with smoke grenades, flares and glass bottles thrown at police. RT’s correspondent Charlotte Dubenskij was tear gassed while reporting from the scene. The rallies, dubbed the “night of the barricades,” are expected to take place in 13 cities across France. The protests erupted minutes after the polling stations closed in the first round of the presidential elections. There is a massive riot police presence on the streets of Paris, with officers wearing full body armor, including shields and carrying batons and pepper spray bottles, as can be seen on images from a Ruptly video. At some point protesters were seen throwing chairs – apparently from nearby cafes – at police officers. Three people have been detained by police at the protest, AP reported. At least one protester has been reportedly injured in clashes with police. The protesters say they are unhappy with all of the 11 candidates taking part in the elections, according RT's Dubenskij. Police are currently trying to kettle the crowd and block it off in one area to prevent the protest from escalating. Protesters brought a makeshift guillotine to the Opéra Bastille to show their dissatisfaction with the elections, claiming they are against racism, sexism, fascism and basically anything that has to do with the establishment, Dubenskij added. “We came to protest against the masquerade that represents this election," a protester said, the French Europe1 news outlet reported. Paris police have issued a warning on Twitter, saying the traffic around the Bastille area is heavy due to the protest. Hashtag #NuitDesBarricades (Night of the Barricades) has appeared on social media, calling upon French voters to join the protest against the election results. People in the city of Nantes in western France staged a protest against the results of the elections. “Neither Macron, nor Le Pen. Long live elections,” said the banners of the demonstrators. According to French media, the rallies in Nantes turned violent, with protesters clashing with police. Violent protests took place in the city of Rennes in northwestern France. Protesters against the results of the elections took to the streets of Rouen, a city in the northern French region of Normandy. They said they stood neither for Macron, nor for Le Pen.